Providing help, answers, support and advice to undergraduate students for their personal and academic success. What are Faculty of Design Expansion Studios? The Student Advising Centre provides a coordinated and centralized model for undergraduate student academic advising. The Student Advising team supports student success by providing a welcoming environment where students can get support and advice related to their personal and academic success. These are all situations where academic advising is particularly valuable, but all questions are welcome! Student Advisors are happy to discuss any situation which might affect someone's ability to participate in school and be successful. If the Advisors are not the experts who can resolve or assist with the issue(s), they will help connect students to those who can. When you meet with a Student Advisor, we make notes about those meetings which you can view through My OCAD U. When you log into My Records, follow the link from Student Planning to Plan & Schedule. Under that selection, you'll see three tabs - your advising notes are on the Advising tab, with the most recent notes first. Drop in hours: Monday to Friday, 10 a.m. to 3:30 p.m.
Space Cat is the Student Advising Centre's mascot because…well, we are pretty nerdy, with a shared fondness for felines and a fanaticism for sci-fi. It's also because our retro kitty is symbolic of the future, shared wisdom and the transformative opportunities that lie ahead for students. Space Cat and his cohorts in the Student Advising Centre will be here throughout your OCAD U adventure to provide guidance, open pathways and empower with support around program requirements, course selection, on-campus resources and much more. Yes, all that—without a time machine, rocket ship or interdimensional portal. The Student Advising Centre is located in OCAD U’s main building at 100 McCaul Street on the second floor in Room 266. Just take the spiral staircase in the lobby (or multilevel vortex, as Space Cat likes to call it) and turn right. 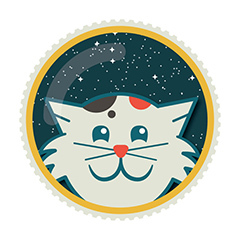 Space Cat was created by OCAD U graduate Marta Ryczko. Marta lives in Toronto and graduated from OCAD U in 2012, where she studied Graphic Design and Illustration. Marta is a keener who likes to inject humour and bright colours into her work. During the day she works as a junior designer, and during the night she tries to sneak in as much zine-making, printmaking and lettering as possible. She also makes a poster every single day. Check out Marta’s portfolio.